Hi! Tonight I'm back to share a card that I made for 5 challenges. I started with Our Daily Bread Designs Shining the Light Challenge 70 which is a sketch challenge and added ODBD Stamping in Time Challenge 40 to use a doily. 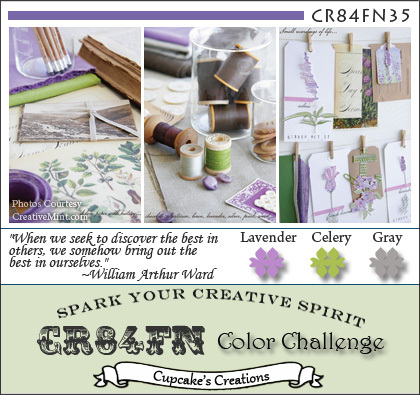 Then I turned to CR84FN for color inspiration, The Shabby Tea Room #73 requires us to use at least 3 dps, and at Papertake Weekly, anything goes! Here's my card. My gray (Bazzill "flintstone") is maybe a little bit too dark, but the only other gray I had was so pale that it almost appeared a pale lavender. I started with a 6" square white cardstock base and then added a 5 7/8" square green panel on top of it. I stitched around the edge of that base green panel as well as the individual squares. The squares are cut at 1 3/4" square which leaves about 1/8" borders. I was thinking a lot about my Mom as I made this card. As those of you who regularly read my blog know, she died the day after my birthday back in April due to a pulmonary embolism (blood clot in the lung). It is still just unbelievable to me that she is gone. I was using my trusty old Elna sewing machine to do the stitching on this card and agonizing about trying to get the stitching to be exactly straight and uniform. I remembered Mom's lessons in sewing (she was a home ec teacher for over 30 years) about using the edge of the presser foot to keep the stitches straight and so on. 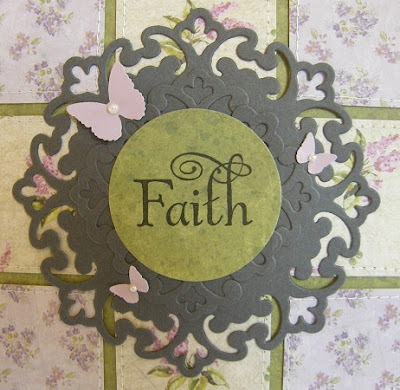 I'm definitely moving forward in the grieving process, but I just have to remember to have faith. I just was entirely unprepared to suddenly lose my Mom at age 66. She would have been 67 in July, and it would have been my parents' 40th wedding anniversary on July 24th. So those days were harder ones for us. I used the gray to make a doily with 2 different Shapeabilities dies. The doily I left as it was, but the other parts layered below were cut apart and layered from the other dies in that set. Here's a closer look. Papers: white cardstock base, all 3 dps (speckly green, lavender with small print, lilac print) are from K & Co.'s "Watercolor" collection, gray is Bazzill Basics "Flintstone"
Other: MS butterflies punch, Recollections pearls, sewing machine, Nestabilities circle die, Spellbinders Shapeabilities "Parisian Motifs"
LOVE those papers squares and the embossed medallion die and the FAITH! PRETTY card! THX for playing with us at CR84FN! 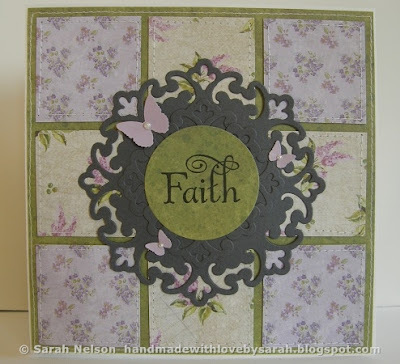 Lovely quilt look to your card! So pretty Sarah!! I just love your take on the sketch and your soft colors!! The decorative doily is perfect!! Thanks for joining the ODBD Shining the Light challenge this week!! What a very pretty card! Great take on the challenge colors! Thanks so much for playing along with CR84FN! Sarah, this is wonderful and that word says it all! Lovely card! Thanks so much for playing ODBD Stamping In Time Challenge!